Discover a big world on a small campus! At NDMU, you won’t get less of the world—you’ll be ready for more of it. With students from many different backgrounds, ethnicities, countries, and beliefs, NDMU will enrich and expand your world-view. Gain confidence, challenge yourself, and become a leader in your life and the lives of others. CHARACTER: Independent, Catholic liberal arts university; established in 1895, Notre Dame of Maryland is in its second century of offering an education of quality and excellence. The Women’s College is a four-year undergraduate program for women. 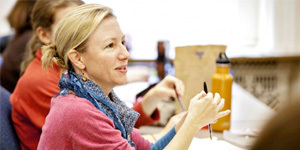 The College of Graduate Studies and College of Adult Undergraduate Studies provide educational experiences emphasizing professional and personal development for adult student populations of women and men. ENROLLMENT: Almost 500 full-time students in the Women’s College at Notre Dame; additionally, more than 2,000 full- and part-time students attend the College of Graduate Studies and College of Adult Undergraduate Studies. STUDENT-FACULTY RATIO: 7:1 undergraduate student-faculty ratio; 105 full-time faculty; 84% hold terminal degrees in their fields. CURRICULUM PARTNERSHIPS: Students may cross-register for courses at six nearby colleges and universities, including Johns Hopkins University and Loyola University in Maryland. INTERNSHIPS: Notre Dame students have impressive résumés even before they graduate, thanks to a strong internship program. Students have interned at such sites as the Space Telescope Science Institute, National Institutes of Health, Discovery Channel, Under Armour, the Johns Hopkins University School of Medicine, law firms, and radio and TV stations. More than 90% of students take part in experiential learning, including internships and study abroad. Through workshops, mentoring, and networking events, the First Impressions program prepares students to find and land that first job after college. SPECIAL FACILITIES: Academic building houses state-of-the-art labs for nursing, an award-winning library, a computer center open seven days per week, graphics and fine arts studios, two exhibition art galleries, television and radio production studios, a student-run radio station, a planetarium, the Marion Burk Knott Sports and Activities Complex, and the Sister Kathleen Feeley International Center, which houses the English Language Institute and the Office of International Programs. TUITION/ROOM AND BOARD (2018–2019): $35,600 tuition; $11,850 room and board; $1,300 consolidated fees; several tuition payment options are available. FINANCIAL AID AND SCHOLARSHIPS: Notre Dame of Maryland University has a long-standing commitment to making a Notre Dame education possible for every student who applies. Financial aid packages typically consist of loans, scholarships, grants, and on-campus employment. SPORTS AND FITNESS: Our 44,000-sq. ft. sports and activities complex is headquarters for eight NCAA Division III varsity teams: basketball, cross-country, field hockey, lacrosse, soccer, softball, tennis, and volleyball. It also houses racquetball courts, a dance studio, training and group fitness classes, an indoor walking track, and a brand-new, fully equipped fitness center. • more likely to assume leadership positions during their careers. 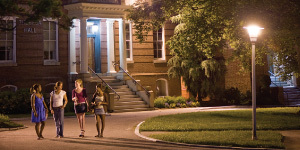 Notre Dame of Maryland University, the distinguished—and only—women’s university in Maryland, provides a vibrant learning and cultural environment in which young women thrive. • Notre Dame has prepared women for leadership since its establishment in 1895 by the School Sisters of Notre Dame. • Notre Dame women live by our Honor Code, which guides decisions and promotes a high standard of integrity— values that inform all aspects of students’ lives. • The pursuit of truth is at the core of learning across the curriculum and is demonstrated by the University’s historic motto: Veritatem Prosequimur (We pursue truth). • Notre Dame is a liberal arts university, distinguished as a leader in academic programs such as Education, Biology, Nursing, Business, Communication Arts, and Psychology. The University is distinctive in its commitment to educate women in the sciences.